Welcome to our Facebook Business Program intro page. 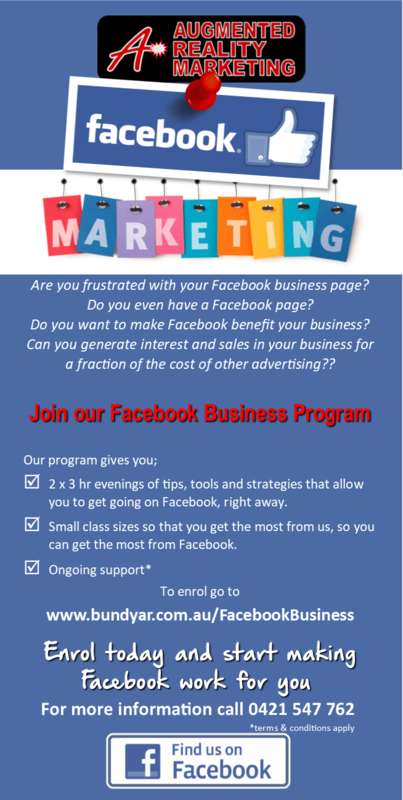 Our Facebook Business Program course is run once a month in Bundaberg. This course, broken up over 2 x 3 hr evenings, teaches you the rules for using Facebook to effectively promote and advertise your business, showcasing it to the world. Valued at over $500, we will give you everything you need to know about just how to run your own Facebook page for your business. Full of tips, tricks, strategies and real world solutions, this course will have you posting and generating fans for your business well before we are finished. Whether you’re a first time poster or an active sharer, there is plenty you can take away and use right away. 2 jam packed evenings, covering everything about what to post, when to post and who to post along with a whole heap of why you post. Small class sizes so you get the most out of us so you can get the most out of your page. Our “bring a friend” offer, because we know it takes more than one person to run business. So bring a friend for free. And while this course is valued at $500, you can enrol today for only $400.00, that’s right, $400 – it’s not a misprint!! Fill out the form below to register and start making Facebook work for your business. Are you interested in using Facebook to advertise your business? If you are, register here for details on our next course.